(SNN) I’ve been told I had a pretty nice job back in the day—entertainment reporter on TV news. 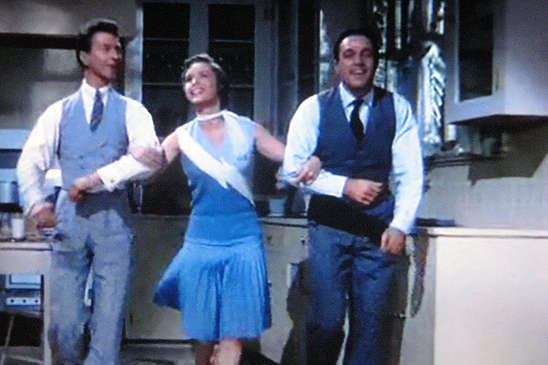 The tragic death of an iconic actress made me realize how fortunate I was to have met and/or interviewed some brilliant performers, few more so than the three stars of "Singin' in the Rain,"—Gene Kelly, Donald O'Connor, and of course, Miss Debbie Reynolds. The encounters happened at different times for different events. I had lunch with O’Connor ages ago when I lived and worked in Washington, DC. Not exactly an exclusive chow-down at an elegant restaurant, but we were put together at a luncheon honoring the Irish. The name “Corcoran” and my gig at a local TV station earned me a seat at the dais, where I was fortuitously parked next to the legendary star known for his dance skills and, later, for co-starring opposite a Talking Mule named Francis. There are certain unwritten relationship rules in situations like this, different than what would apply for a work-related interview. The velvet rope between True Celebs and All Others is slightly lower for such occasions. On this day, I wasn’t a journalistic supplicant, but another guy at the dais. I suspect it wouldn’t have mattered much with O’Connor anyway. He had a rep as an Irish mensch and all around decent guy. He was happy to talk about his work on “Singin’ in the Rain,” and while reports from on set indicated Gene Kelly was a professional pain in the derriere to him, he said Kelly’s perfectionism taught him a lot about his own dance skills and professional work ethic. I felt like the head of a mob family being introduced to a fellow Boss. But what was apparently some kind of code phrase worked like a charm. Kelly perked up, smiled and then answered each of my questions in detail and with no hint of the infamous Kelly temper. This included confirming the rumor he was quite sick when he did the famous “Singin’” dance sequence and also comparing his dance style with that of fellow legend Fred Astaire. And then there was the legendary Debbie Reynolds, whose death December 28th—the day after daughter Carrie Fisher’s passing--has so deeply effected her fans and those who met or worked with her in the business. Not all stars make indelible impressions on their interviewers, whether trying to or not. Miss Reynolds most certainly did with this reporter. A lot of descriptive words come to mind. For starters, she was a pistol. Bright and smart and funny and cool and talented and still drop-dead gorgeous in her then sixties. What fun it was just to be in the same room with her. She had an absolute elegance, but none of that “I’m a Star and You’re Not” attitude some others cannot help but convey. I knew the time I got to spend with her was special, and something I would long remember. Um, about my memory…. My current, diminishing brainpower and the occasional dimwittedness of my past have conspired to let me down. Before the camera rolled, in the pre-interview chat, I lobbed up an unintentional straight line to Miss Reynolds. (I hate when that happens.) But this time—lucky me—she swung for the seats and put it out of the park. Then she roared with laughter, as did I, as did everyone in the room. Here's the bad part. I don't remember what I said, and I don't remember what she said in response. My fervent hope is I wrote it down eventually, and it is somewhere in my "files" and I will find it someday. But know this about Miss Reynolds. She lit up the room with sweetness, kindness, and joy. I had expressed frustration early in my career that the time constraints of TV news meant only small portions of my interviews with stars appeared on air. A fellow entertainment reporter gave me a great coping mechanism. Photo: Some rights reserved. Image from Tnarik Inneal flickr photostream. Original photo can be found here. DISCLAIMER: The above article is provided for entertainment purposes only. The opinions, beliefs and viewpoints expressed by the authors of The Sage Entertainment and forum participants on this web site do not necessarily reflect the opinions, beliefs and viewpoints of the The Sage News Network or the official policies of the The Sage News. From Brothers, Who Are You? to O Brother Where Art Thou?